Last night, I went to the theatre to see “Moonrise Kingdom.” The story set in 1965, takes place on a New England island called “New Penzance.” The story unfolds after two young characters meet and become pen pals. Suzy runs away from home with her cat, lugging a collection of stolen books and a record player. Sam escapes from scout camp, prepared as a scout would be, to encounter the wilderness. They meet up in a meadow and then embark on a journey with the goal of reaching a secluded cove. 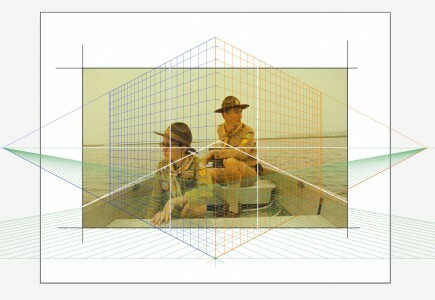 Primarily composed using a strong grid, the rule of thirds, the landscapes in this film depict a controlled, designed vision. Carefully placed characters graphically relate to the horizon line and the vanishing point. The cinematographer set the views almost entirely in one-point perspective, an effect similar to peering into a dollhouse. The camera must have been locked into two contraints. It appeared as if the camera movement was fixed to a rail, moving horizontally and vertically. One-point perspective communicates the feeling of containment in a box. It is a controlled vision of the elements selected for the box. Pieces of ephemera, gallery announcements, special cards and chinese fortunes get stashed away in boxes. The items stowed away in a box eventually become faded, iconic notions of the past.